The California had changed location and moved north along Sisowath Quay since we last stayed there in 2008, but the friendly and helpful atmosphere was the same. This is the best place to hang out in Phnom Penh if you want to meet expats and travellers and, of course, benefit from the experience and wisdom of Jim, the proprietor. Downstairs there is a large well-stocked bar and a free pool table. It’s a spacious place so even though it can get a little busy at peak times there’s plenty of room to relax. If you sit at the bar, you can be sure of meeting some interesting characters. Whilst not billing itself as being accessible for disabled people, it would be possible for a wheelchair user to eat, drink and go to the toilet. (So many places let you eat and drink but have completely inaccessible toilets.) In the California, there’s a small ramp up to the WC cubicles and both have extra-wide doors. Upstairs (no lifts) consists of 10 guestrooms, all beautifully clean and nicely furnished. It’s fair to say the standard rooms are “compact” but the space has been put to good use and we were very comfortable there. We had hoped to book a deluxe room but had left it a bit late and the deluxe rooms were already fully booked. Jim therefore put us in the best standard room, which we were very happy with. I can’t imagine finding anything better for the price. ($27-$35 per room per night.) It’s in a great location, clean and comfortable, and the bar is a lot of fun. We were a little bit surprised when we received our bill at the end of our stay. The staff member asked if we were shocked because it was so much, but that wasn’t the case at all. Quite the opposite – we had expected it to be more, so that was a nice surprise. There’s a good menu of breakfasts (served all day), Mexican food, some Western favourites and Khmer food. The food is very reasonably priced and tasty. We ate there several times. There is free WiFi throughout, in the bar and in the rooms. Smoking is allowed. 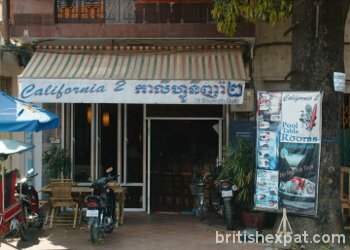 To sum up, the California will be our first choice of where to stay when we next visit Phnom Penh. Highly recommended! Book Phnom Penh hotels NOW with Agoda! This entry was posted	on Monday 28 November 2011 at 14:42	and is filed under Cambodia, Hotel reviews. You can follow any responses to this entry through the RSS 2.0 feed. You can leave a response, or trackback from your own site.